Congratulations go to former European and World Championship of Custom Bike Building finalist Jerry Caronte of Custombike Srl, from Modligliana, near Imola in Italy. 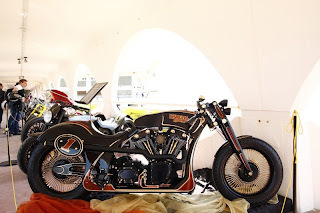 Jerry won Best In Show at the recent Italian Motorcycle Championship, staged by Italian custom magazine Bikers Life, at the 26th annual Biker Fest Rally held at Lignano Sabbiadoro, north of Venice on Italy's Adriatic coast. With the win came bike freight expenses to compete at the AMD World Championship at Sturgis this year - this was the first time that the event had been an AMD World Championship affiliate. Jerry's heavily modified 2007 Harley-Davidson Street Glide is a tribute to AMA Hall of Famer Otto Walker, a leading racer of the 1910s and early 1920s, and one of Harley's first professional factory riders. Harley had not long entered racing when Walker gave Harley their first major race win, a 300 mile road race at Venice, California in April 1915. In a career interrupted by injuries and WW1 military service (as an aviation electrician), Walker developed a distinctive riding style to improve his aerodynamic efficiency, earning himself the nickname 'Camelback' Walker. In addition to notable career wins at Dodge City, Sheepshead Bay, NY., and Ascot Park in Los Angeles, Walker became the first ever motorcycle racer to win at an average speed of over 100 mph (Fresno, California, February 2nd 1921). Walker set numerous American speed records as he earned himself a reputation as rider who could win the big events, and his success contributed to the dramatic effect that early race glory had on Harley sales. Based on an H-D/Screamin' Eagle TwinCam 96 with 6-speed transmission, the Coker Tire shod homage to Walker's race bikes features many original touches by the team at Custombike, including a hydraulic clutch and modified springer front-end, as well as aftermarket parts from the likes of RSD (air cleaner), S&S (Super G Carb. ), Kustom Tech, Pingel, and Rizoma. Jerry took a narrow win over former Ferrari engineer Ferruccio Codutti.